This baseball field cake was made for my nephew’s 14th birthday. He loves to play baseball. He was so happy when I gave him this cake at his birthday party. He had about 10 boys at his party and each time a guest arrived he took them straight to see his cake. What was funny about this was all the boys kept asking me to make them a birthday cake on their birthday. This is a 14 inch round single layer chocolate cake. It is covered with homemade butter cream frosting. The center field is chocolate butter cream and the grass is green butter cream I used a grass tip to make the grass on the field. The hat was made of fondant and field outline is made of fondant. This could also be made a double layer. The center logo and baseballs also made of fondant. 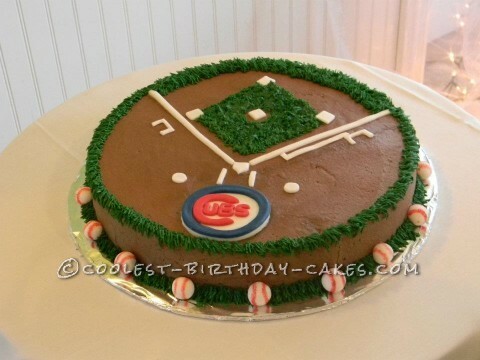 This is an easy cake to make and anyone could make this baseball diamond cake.